Why do I love Sweet Peas? This was the question I asked myself to stir the creativity in my brain. I chose the subject for this blog, after all. I knew we received a good selection of sweet peas in at the nursery. Sweet Peas are something that can be planted early (like now) from seed or starts. They are fragrant (most of them at least) and they make a nice cut flower. I could tell you all of that in about 3-5 sentences, but that doesn’t tell you why I am particularly enamored with this lovely flower. To find the answer, as always I searched in my memory. The first thing that came to mind was my grandfather and his garden on the Puget Sound. He was a farmer by trade. By the time I got to know him he was retired from farming and driving a school bus to bring in some extra income. Or to keep busy. He was a slow-moving but very hard-working man. He and my grandmother had a nice, large yet simple house that overlooked the Puget Sound in the key peninsula of Washington state. There was a lot of lawn to mow, a few flowers, chickens and a very large garden. Grandpa Allen loved to fish and dig for clams and oysters. I learned about recycling first from him. He loved my grandmother and brought her orange juice in bed every morning. I could probably write a book about him. The only things that I remember about his garden are that it was huge, it was fully enclosed by deer fencing (and sometimes they still got in), he had a huge raspberry bed and he always grew sweet peas. I’m guessing now, with adult knowledge, they were probably the mixed colors of old-fashioned Sweet Peas, possibly Royal Family. As I was talking this over with my husband (he is often my muse) he asked me why my grandfather grew Sweet Peas. My answer was I remember him bringing a small bouquet for my grandmother to use on the table. Very simple, beautiful and fragrant. Just like my grandparents. So that memory, the beautiful photos on the seed packets and the early appearance of plants persuaded me to plant Sweet Peas. I think I am enamored with their cottage garden style and romanticism. They are “the Queen of the Annuals” and the flower of April. Sweet Peas were first discovered in Italy by Franciso Cupani. Great Britain has wholly embraced them. They have been bred from the original (what I refer to as Old-fashinoned but also called Grandifloras) into at least two more types: Spencers and Cuthbertsons. If you want to read more about their history, check out http://austinwildflower.com/?s=sweet+peas. 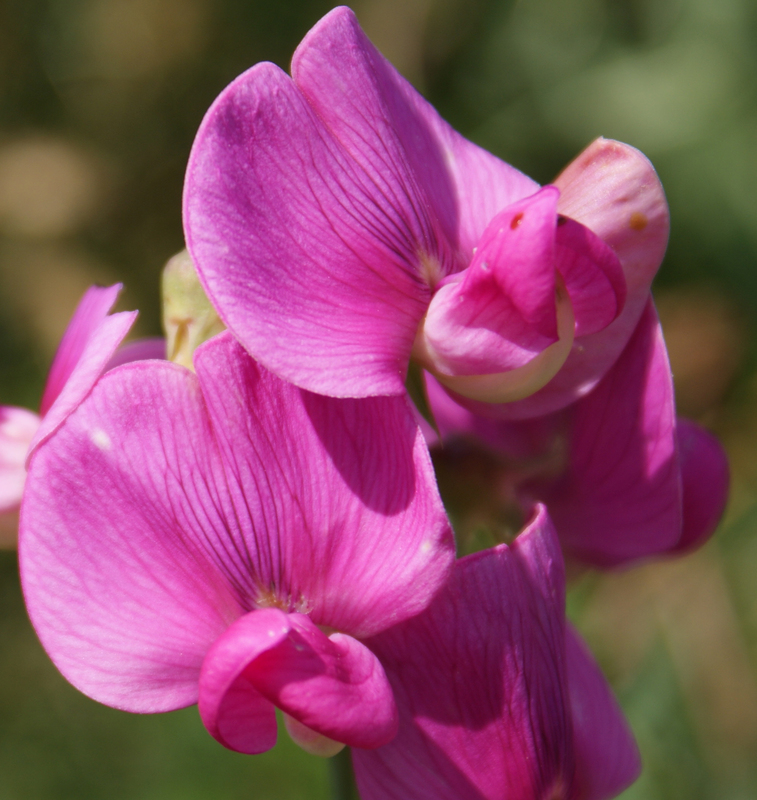 Surprisingly, the original, first cultivated variety, Cupani Sweet Pea is still available in seed through Renee’s Garden (Renee’s seeds are available at Garland Nursery). As is the second cultivated variety-Painted Lady (in plant form, too). Renee’s Gardens has single varieties and a number of lovely blends. My current favorite is Jewels of Albion, a combination of: Captain of the Blues, Flora Norton, Lady Grisel Hamilton, Lord Nelson, and Mrs. Collier. Check out a blog at reneesgarden.com/articles/sweetpea.html. The main types available are the Old-fashioned or Grandiflora type, the Spencer varieties, and the Cuthbertsons, which have a sub-category-Early Multiflora Giganteas. The Old-fashioned varieties are antiques, popular in the early 1900’s. They keep blooming even in hot weather. They are very fragrant. Varieties include: April in Paris, Incense Mix, Lord Nelson, Old Spice varieties, and Painted Lady. The Spencer varieties have ruffled blooms. They are the largest flowers. 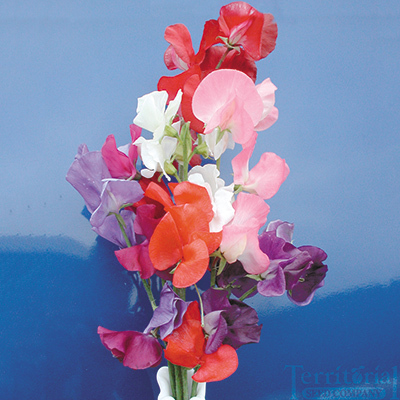 Their long stems make them the best Sweet Pea for cut flowers and arrangements. They are usually fragrant. They include: Apricot Sprite, Blue Ripple, and Winston Churchill. Cuthbertsons and Early Multiflora Giganteas are early flowering varieties often called “winter-flowering types”. They are often fragrant and are well suited for coastal climates. In this group are the Royal hybrids and Mammoth Choice. Sweet Peas can be started directly in the garden by seed or transplanted as starts. Seeds germinate best once the soil is 55 deg F. Plant your sweet peas in full sun in a garden spot with well-drained soil. 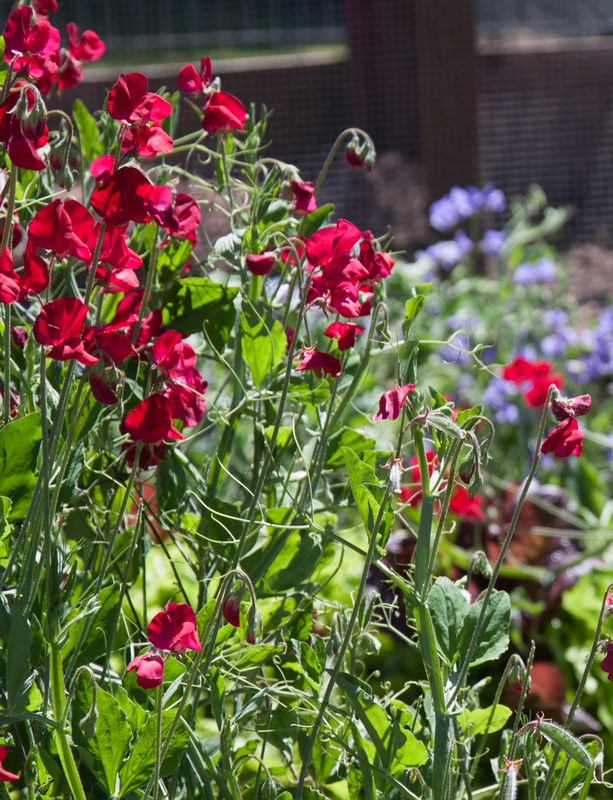 If summer weather is hot very early in the season where you live, sweet peas can thrive in a spot with morning sun and bright afternoon shade. Dig deeply to loosen the soil and enrich it with aged manure or compost before planting seeds. Don’t forget to set up a well-anchored trellis, fence or vertical support for climbing varieties before planting seeds. If all your seeds don’t germinate in 10 days to two weeks, don’t hesitate to plant more as they will catch up quickly. Some gardeners like to soak sweet peas overnight before planting them; others never do it and still have good results. If you do soak seeds, be sure you leave them in water no longer than eight hours before planting immediately.Transplants and new seedlings should be protected from slugs and snails. Happy Gardening to you. 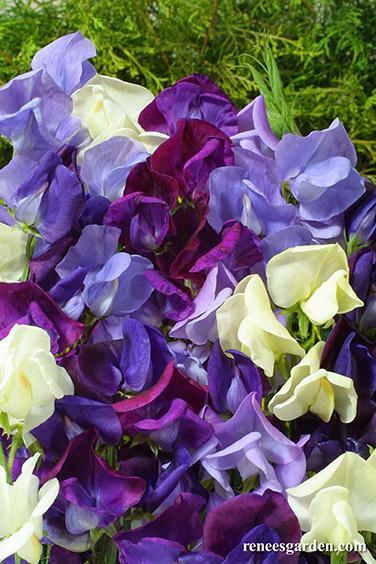 Enjoy the lovely bouquets of fragrant sweet peas you will be cutting in just a few months. I am a fan of sweet peas, too and found a nice read a while ago, “The Sweet Pea Book” by Graham Rice. Worth a look. Oh, and Francesco’s was delightful. Thank you for the recommendation. Thanks, Francina. I’m glad you enjoyed Francescos!